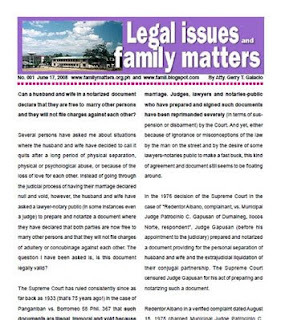 Legal Updates on the Family Code Philippines and relevant matters: Can a husband and wife in a notarized document declare that they are free to marry other persons and they will not file charges against each other? Several individuals, either personally or by e-mail, have asked me about situations where the husband and wife have decided to call it quits after a long period of physical separation, physical or psychological abuse, or because of the loss of love for each other. 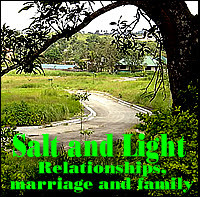 Instead of going through the judicial process of having their marriage declared null and void, however, the husband and wife have asked a lawyer-notary public (in some instances, barangay officials or even a judge) to prepare and notarize a document where they have declared that both parties are now free to marry other persons and that they will not file charges of adultery or concubinage against each other. The question I have been asked is, Are these documents legally valid? The Supreme Court has ruled consistently since 1933 (that’s 75 years ago!) that such documents are illegal, immoral, and void because they undermine and subvert the institution of marriage (Panganiban vs. Borromeo 58 Phil. 367). Judges, lawyers and notaries-public who have prepared and signed such documents have been reprimanded severely (in terms of suspension or disbarment) by the Court. And yet, either because of ignorance or misconceptions of the law by the man on the street or by the desire of some lawyers-notaries public to make a fast buck, this kind of agreement and document still seem to be floating around. Posted below are excerpts from the 1976 decision of the Supreme Court in the case of “Redentor Albano, complainant, vs. Municipal Judge Patrocinio C. Gapusan of Dumalneg, Ilocos Norte, respondent.” In this case, Judge Gapusan (before his appointment to the judiciary) prepared and notarized a document providing for the personal separation of husband and wife and the extrajudicial liquidation of their conjugal partnership. The Supreme Court censured Judge Gapusan for his act of preparing and notarizing such a document. Redentor Albano in a verified complaint dated August 18, 1975 charged Municipal Judge Patrocinio C. Gapusan of Dumalneg and Adams, Ilocos Norte with incompetence and Ignorance of the law for having prepared and notarized a document providing for the personal separation of husband and wife and the extrajudicial liquidation of their conjugal partnership and (2) with having allegedly influenced Judge Zacarias A. Crispin of the Court of First Instance of Ilocos Norte in deciding two criminal cases. In 1941 or five years before his appointment to the bench, respondent Gapusan notarized a document for the personal separation of the spouses Valentina Andres and Guillermo Maligta of Barrio 6, Vintar, Ilocos Norte and for the extrajudicial liquidation of their conjugal partnership. It was stipulated in that document that if either spouse should commit adultery or concubinage, as the case may be, then the other should refrain from filing an action against the other. Judge Gapusan denied that he drafted the agreement. He explained that the spouses had been separated for a long time when they signed the separation agreement and that the wife had begotten children with her paramour. He said that there was a stipulation in the agreement that the spouses would live together in case of reconciliation. His belief was that the separation agreement forestalled the occurrence of violent incidents between the spouses. Albano in filing the malpractice charge is in effect asking this Court to take belated disciplinary action against Judge Gapusan as a member of the bar or as a notary. (He was admitted to the bar in 1937). There is no question that the covenants contained in the said separation agreement are contrary to law, morals and good customs (Biton vs. Momongan, 62 Phil. 7). Those stipulations undermine the institutions of marriage and the family, "Marriage is not a mere contract but an inviolable social institution". "The family is a basic social institution which public policy cherishes and protects." (Arts. 52 and 216, Civil Code). Marriage and the family are the bases of human society throughout the civilized world (Adong vs. Cheong Seng Gee, 43 Phil. 43; Ramirez vs. Gmur, 42 Phil. 855, 864; Goitia vs. Campos Rueda, 35 Phil. 252, 254; Brown vs. Yambao, 102 Phil. 168). To preserve the institutions of marriage and the family, the law considers as void “any contract for personal separation between husband and wife” and "every extrajudicial agreement, during the marriage, for the dissolution of the conjugal partnership" (Art. 221, Civil Code). Before the new Civil Code, it was held that the extrajudicial dissolution of the conjugal partnership without judicial sanction was void (Quintana vs. Lerma, 24 Phil. 285; De Luna vs. Linatoc, 74 Phil. 15). A notary should not facilitate the disintegration of a marriage and the family by encouraging the separation of the spouses and extrajudically dissolving the conjugal partnership. Notaries were severely censured by this Court for notarizing documents which subvert the institutions of marriage and the family (Selanova vs. Mendoza, Adm. Matter No. 804-CJ, May 19, 1975, 64 SCRA 69; Miranda vs. Fuentes, Adm. Case No. 241, April 30, 1966, 16 SCRA 802; Biton vs. Momongan, supra,, Panganiban vs. Borromeo, 58 Phil. 367; In re Santiago, 70 Phil. 66; Balinon vs. De Leon, 94 Phil. 277). Respondent Gapusan as a member of the bar should be censured for having notarized the void separation agreement already mentioned. Good day! I read your article about having an agreement between spouses that they are officially separated. I agree that we need to protect the sanctity of marriage and family but how about those who cannot live anymore with each other and cannot afford to file the proper or legal annulment? The cost is way high but they also want to be happy. So how can they be happy if they are bound on that contract (marriage)? Marriage is a special contract of permanent union between a man and a woman entered into in accordance with law for the establishment of conjugal and family life. It is the foundation of the family and an inviolable social institution whose nature, consequences, and incidents are governed by law and not subject to stipulation, except that marriage settlements may fix the property relations during the marriage within the limits provided by this Code. plano po naming mgpakasal sa muslim ng bf ko dahil kasal sya sa 1st wife nya sa huwes.does it help para di kami mahabol ng 1st wife nya?hindi na po sila nagsasama ng asawa nya ngaun.worried po ako ngaun kasi i feel i am pregnant. sana po masagot nyo asap ito kasi we are in big trouble now. thank you very much and more power! I've read about your article. On my part,I'm married for 9 years already. my husband went to abroad 2002. I separated with him 2 years ago after knowing and proven that he has a mistress from 2004 till present. They had a child. He's not supporting my son continously starting year 2005 till now. I want a legal separation. As foe me, i'm having a hard time hanging on our marriage coz i can't feel any love for him anymore. just because of that marriage why i can't have peace. For me, it's better to have an official separation for people who both agreed to have it. I have a favor to ask. Can you me a legal way to get support from my husband for me and my son? and any further info about my situation. I hope you could help me on this. For free legal assistance, please contact the DOJ Action Center. The DOJAC acts on complaints, requests for assistance and legal queries of walk-in clients of the DOJ. For legal assistance please visit the Department of Justice Action Center (DOJAC) Main Office, Ground Floor, Multi-Purpose Building, Padre Faura Street, Ermita, Manila; Telephone no: 523-84-81; Email Address: dojac@doj.gov.ph or visit any Regional/Provincial/City Prosecution Offices in your town or city. 1. Because there is a subsisting marriage, you and your boyfriend cannot get married. The legal wife can file a case of bigamy under the Revised Penal Code and psychological violence under RA 9262. Your boyfriend needs to have his marriage declared null and void, for example, using Article 36. 2. With regards the financial support for the children, your boyfriend can ask the help of the DSWD in his town or city so that he and the wife can come up with an amicable settlement on this issue. OR your boyfriend can file a petition in court asking it to set the amount of support and the terms and conditions for such. i am legally married since 1996 and was separated (not legally)since 2001. We had 2 children. now, I have a live-in partner since 2003, we have 2 children. I am married and still carries the surname of my 1st husband. 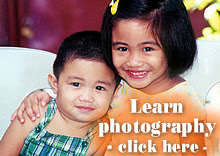 What will be the legal surname of my children? how will i declare my name in their birth certificate? my married name or my maiden name? can my 2 children have the surname of my live in partner? he is the biological father by the way. You are in a legal mess. Please read my post “If a wife gets pregnant by a man not her husband, will the child be legitimate or illegitimate?” (look for the link in the sidebar). Its giving me a whole lot of info,especially in this area of difficult situation of marriage life.The Lord bless your ministry. I have a friend whose husband ran away with another woman.He's a deacon of a Baptist church and she is an auditor of the same church. She's confused as a mother, raising her children at her age 47.The man quit supporting after a few months as he has promised. She plans to "move on" with life by marrying an Australian,68 yo, who would ship her away. How could she do it? We dont have divorce here in PI.Pls help. Your friend will just add more problems to the ones she has now. If she marries this Australian guy, she can be charged with bigamy. This is a public crime which anyone can file against her. Her “marriage” to this Australian will also be adulterous from the Biblical point of view. Me and wife have been seperated (but not yet legally) for more than 3yrs. Since the beginning Iam willing and have been supporting my child financially, but just recently my wife doesnt want me to see my son. Even so Iam willing to provide financial support and not so whatsoever hurt my son physically or nothing a like. What would be my rights regarding visitation? thank you. You can file a petition in court asking it to set the terms and conditions whereby you can have custody and/or visitation with your son. Before going to court, you can ask the help of the DSWD in your town or city to help mediate this conflict with your wife.